[Before Paradise] Lost and Found | LIVING IN THE PACIFIC - Philippines to Guam... One Day at a Time! [Before Paradise] Lost and Found – LIVING IN THE PACIFIC – Philippines to Guam… One Day at a Time! When the packing begins, you just never know what you might find packed away in the attic or in the bottom of a closet or elsewhere. While going through some stuff in my closet this week, I found several odds and ends and things that I really have no use for anymore, and one thing in particular. Several years ago we built a custom spec home and I was doing some grading work with my tractor. Building a home on a steep hillside was a challenge and even more so trying to stabilize the dirt until the lawn developed. I had to constantly move the dirt that rains would wash down the hill, back up to fill in the washed out spots. One day I brought a load up from the bottom of the hill to the top and while spreading it out with a rake, I found a piece of Indian flint. 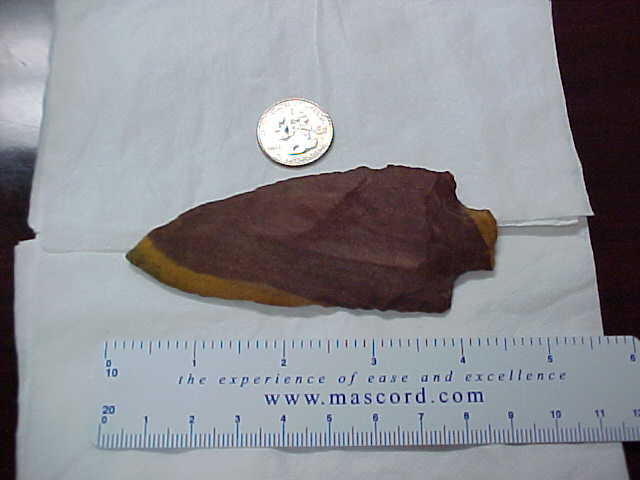 Actually, it was more than just a piece of flint, it was a rather large and well-preserved (perfect) knife point, nearly 4.5 inches in length. I took the perfect specimen to a friend in Tupelo who happens to be a big collector and expert, and after about a 5 minute assessment, he offered to purchase it from me. Now, being that I’ve been around the block a few times and I’m so darned smart, I immediately figured it was worth more than what he offered me on the spot. Besides I had no knowledge of these things and he could have been taking advantage of me. So, I declined his offer and away I went. Anywho, a lost treasure has been found in my closet and I’m cashing in on it. I doubt it would do me any good in the Philippines, unless I really wanted to get back to the basics of surviving as one in harmony with nature. But I don’t think so. I’m perfectly fine with taking a step back in time, but not quite that far! Tabo bathing is about as primitive as I want to get. This entry was posted in Before Paradise and tagged ancient pottery, antiques, archaic find, arrowheads, balikbayan box, flint stone, Indian relics, knife point, moving and packing, moving to the philippines, nomadic tribes, oversees, Philippines. Bookmark the permalink. ← [Before Paradise] Liquidating is Not That Easy! Well that’s pretty good news. Not as good as, “We have a buyer for the house” or “The sale of our house is complete”, but it’s better than a sharp stick in the eye. I hope you get at least the $400 for it.